Mean annual spending for the bottom half of (the American population) distribution was just $236 per person, totaling only $36 billion for the entire group of more than 150 million people. We don’t know why the 150 million people did not consume much in the way of “health services”– they might have been healthy and had no need for healthcare beyond routine tests, or they might have needed care and been unable to afford it, despite the Orwellian-titled Affordable Care Act (ACA).But let’s assume that the 150 million people–roughly half of America’s 317 million residents–were healthy and had no need for health services beyond minimal prevention and a few low-cost tests. The total cost of their care was $36 billion–just over 1% of the nation’s $3.2 trillion bill for healthcare and healthcare insurance. Let’s assume that 90% of the populace was healthy, and the remaining 10% were very ill and needed 100 times as much care as the healthy. The total cost of caring for the 285 million healthy people would be roughly $67 billion, or just over 2% of the $3 trillion we currently spend on healthcare. The very ill 32 million would need $23,600 each, or $755 billion. The total cost for a largely healthy population and 32 million ill people who required 100 times more care than the healthy would be $822 billion, or roughly 25% of the $3.2 trillion we currently spend annually. Here is an example of the insanity of U.S. healthcare costs. One of our European friends was doing post-doctorate research at a major U.S. university. His son suffered a minor burn in the kitchen, and on the doctor’s recommendation, the parents took the toddler to a hospital a few days later to have the dressing–basically a piece of gauze taped over the burn–changed. Naive to the absurdities and costs of U.S. healthcare, the parents followed these instructions rather than just changing the gauze themselves. Their punishment for foolishly asking the medical establishment to spend 5 minutes changing a small piece of gauze: a bill for $875. The list of similar charges is equally absurd. Among those known to me first-hand: $120,000 for a few days in a hospital, no operation, not intensive care; $6,000 for 20 minutes sitting in an observation room after a minor outpatient surgery on the patient’s big toe–the list is essentially endless. Readers are quick to note that the charges may not be paid in full–but that is no defense of the system. So that makes it OK that Medicare is charged “only” $80,000 for a few days in a hospital bed, or “only” $5,000 for sitting in a room for 20 minutes? Estimates of the cost of paper-shuffling and fraud in our healthcare system start at 40%. Outright fraud (billing for phantom services and patients) accounts for an astounding percentage of healthcare expenditures, as do needless/ineffective tests and procedures. Prevention is cheap, intervention and care of chronic disease is costly. Young obese men suffered 18.8 more years of poor health leading up to their early deaths compared to men of healthy weight, while young obese women suffered 19.1 years of poor health. Even when obesity emerged just in old age, both men and women were found to lose years off of their lives: for men, an average of 3.7 years and for women about 5.3 years. Americans spend $60 billion annually on weight loss programs and products, yet we become more overweight every year. Note that this $60 billion is almost twice the amount spent on healthcare for 150 million Americans. As our waistlines expand, so too do the number of medical problems caused by excess body weight. A 2012 report by the Robert Wood Johnson Foundation, “F as in Fat, How Obesity Threatens America’s Future,” found that if obesity rates continue on their current trajectories, the number of new cases of type 2 diabetes, coronary heart disease and stroke, hypertension, and arthritis could increase 10-fold between 2010 and 2020—and double again by 2030. “As evidence unfolds, everyone is beginning to appreciate that obesity and excess body weight are driving medical conditions and costs. You cannot get medical costs under control as long as we have these rising rates of obesity,” says Donna Ryan, MD, professor emeritus at Pennington Biomedical Research Center at Louisiana State University Health System, and previous past president of The Obesity Society. 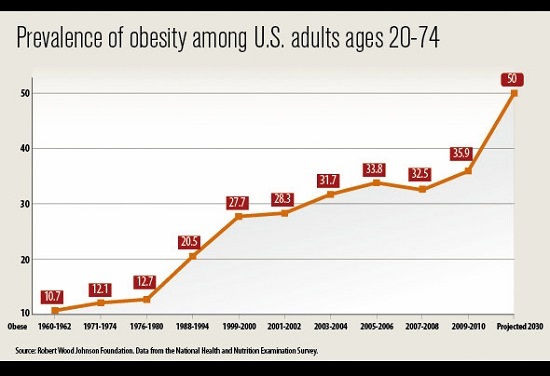 That America’s ill health has become a national security risk is obvious: America: Too fat to fight. Excess body weight threatens not just the nation’s health but its economy and social fabric: F as in Fat: How Obesity Threatens America’s Future (Robert Wood Johnson Foundation). Anyone who thinks the stagnant American economy that already spends twice as much per person on healthcare as our advanced 1st World competitors can support 10-fold increases in lifestyle-caused chronic diseases is living in Fantasyland. The pharmaceutical industry has a plan to “cure” diabesity–their fondest dream is a bunch of pills that cost $84,000 a year, just like the recent treatment for Hepatitis C. Patients Get Extreme to Obtain Hepatitis Drug That’s 1% the Cost Outside U.S.
1. Care will become scarce within our “somebody else pays for me” system as the system starts breaking down. 2. Care will become cash only as payments to frontline providers dwindle. The “cure” for excess body weight is well-known and well-documented. The vast majority of us can only change our lifestyle and thus our weight and health within a support group of others engaged in the same challenge. Supplements don’t work, fad diets don’t work, gym memberships (lacking a total transformation of lifestyle) don’t work–nothing works but continual human support from those dealing with the same issues. U.S. healthcare is unsustainable. That it will break in the next decade is predictable. We are collectively wandering the beach, picking up seashells, while a mighty tsunami wave is approaching that will wash everyone on the beach away. We can either deal with the lifestyle and cultural causes of our mounting ill health or be swept away when the system crashes.